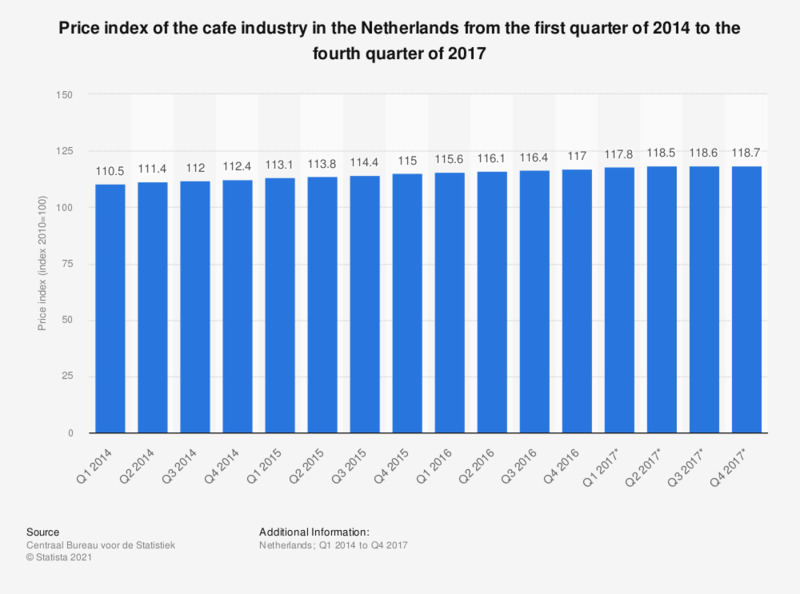 The statistic illustrates the price index of the cafe industry in the Netherlands from the first quarter of 2014 to the fourth quarter of 2017. It can be seen that, in the fourth quarter of 2017, the price index was 118.7. The price index indicates the price development of goods and services sold. - Provision of beverages for immediate consumption, possibly in combination with amusement and the selling of small edibles in cafes, bars. clubs, night clubs, beer halls, buffet in theaters. - Exploitation of halls for feasts and parties with catering. - Provision of beverages in coffeeshops in combination with the selling of soft drugs. - Provision of beverages in combination with providing overnight accommodation. - Provision of beverages in sport-, school- and company cantines. - Exploitation of halls for feasts and parties without catering. * Figures 2017 are provisional.